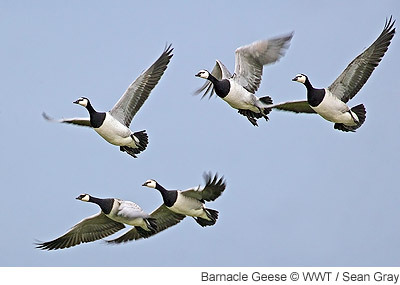 The Svalbard population of Barnacle Goose breeds on the Svalbard archipelago, mainly in Spitsbergen, and winters predominately at the Solway Firth, which is on the border of Dumfries & Galloway, Scotland and Cumbria, England. The wintering range of this population is small and the birds tend to remain within 5 km of their roost sites on the mudflats of the Solway coast, ranging along the firth to sites no more than 50 km apart. Variable (generally 5-15%) but more low years (<5%) since late 1990s. Annual estimates of the population size, percentage of young (%) and mean brood size (young per successful pair) of Svalbard Barnacle Goose, 2003/04-2017/18; recorded at the Solway Estuary. The Svalbard population of Barnacle Goose breeds in the Svalbard archipelago, mostly in western Spitsbergen, the largest of the islands. Migration begins in late August and early September, and many stage on Bear Island, Norway, for up to three weeks before continuing their migration southwards. Some, however, are known to migrate direct to the wintering grounds of the Solway Firth, on the border between Scotland and England. Return passage begins in mid- April, and during this migration most birds stop over at Helgeland and Vesterålen, off the west coast of mainland Norway, for two to three weeks, before reaching Svalbard by the end of May (Griffin 2008). The wintering range of this population is small and the birds tend to remain within 5 km of their roost sites on the mudflats of the Solway coast, ranging along the firth to sites no more than 50 km apart. Winter habitat use is confined to saltmarsh and improved pastures on the Solway. Feeding occurs preferentially on Trifolium repens in autumn on saltmarsh habitats, supplemented by grasses and herbs, and on Lolium perenne on pasture. In autumn, the geese may also forage in stubble fields for spilt grain. Four principal areas on the Solway are used, namely farmland around Caerlaverock and Southerness on the Scottish side of the Solway and Rockcliffe Marsh and Newton Marsh on the English side (Owen & Black 1999, Griffin & Mackley 2004). However, other areas are, to an increasing extent, also being used including areas along the River Nith towards Dumfies, and areas further west around Colvend, Auchencairn, Rascarrel and Wigtown later in the winter. Also to a lesser extent, sites further east around Redkirk and Gretna are also being utilised. With increasing numbers of birds in the population, conflicts have arisen as a result of damage to agricultural crops by grazing geese. Consequently, in 1993, Scottish Natural Heritage established a goose management scheme to help alleviate such problems. Griffin, L.R. 2008. Identifying the pre-breeding areas of the Svalbard Barnacle Goose Branta leucopsis between mainland Norway and Svalbard: an application of GPS satellite-tracking techniques. Vogelwelt 128: 226-232. Griffin, L.R. & E.R. Mackley. 2004. 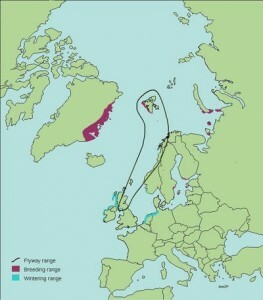 WWT Svalbard Barnacle Goose Project Report 2003-2004. WWT Report, Slimbridge. Owen, M. & J.M. Black. 1999. Barnacle Goose Branta leucopsis: Svalbard. In: Madsen, J., G. Cracknell & A.D. Fox (eds.). 1999. Goose populations of the Western Palearctic. A review of status and distribution. Wetlands International Publication no. 48, Wetlands International, Wageningen, The Netherlands/National Environmental Research Institute, Ronde, Denmark. Coordinated counts of Svalbard Barnacle Geese are undertaken at least once a month from September through to May, with weekly counts carried out during the arrival and departure periods. Age assessments are also made, during which counters record the proportion of first winter geese present within flocks as well as brood sizes (i.e. the size of family groups) to determine the breeding success of the population. Surveys of Svalbard Barnacle Geese are organised by WWT as part of a long-term research programme on this population. Results from these surveys can be found on the ‘Latest results’ page. The adopted total for this population wintering on the Solway Firth in 2017/18 was 42,600 geese (the mean of the maximum count of 43,545 and the other count within 10% of this, rounded up to the nearest 100). 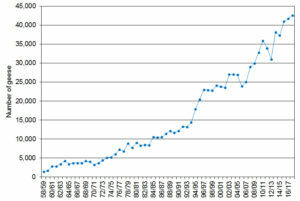 This represents an increase of 900 birds on last winter’s adopted total of 41,700 geese (Figure 1). Figure 1. Annual census-derived estimates (for the Solway Firth only) of the Svalbard Barnacle Goose population size, 1958/59–2017/18. The first arrival of Barnacle Geese thought to be genuine migrants from Svalbard was a flock of 121 recorded on pasture at WWT Caerlaverock on 17 September 2017. As with last year, the number of Barnacle Geese built up very slowly on the Solway as a whole with only 140 present by the morning of 4 October 2017. By 8 October further flocks were starting to arrive and there were almost 9,000 in the Caerlaverock area by the afternoon. By 13 October there were over 34,000 on the Solway as a whole and nearly 41,500 by 25 October, the second highest census count of the 2017/18 season. It was not until 18 April that the peak count of 43,545 was recorded on the Solway, probably due to significant numbers of birds staging/wintering on the east coast at Budle Bay, Northumberland until mid-March 2018. Over 37,000 geese were recorded quite regularly – four out of eight census counts – between the end of October 2017 and the start of May 2018. The first evidence of significant spring migration was seen by 2 May with at least 31,000 geese gathered at the east end of the Solway on Rockcliffe Marsh, Cumbria (including Burgh Marsh and Redkirk Marsh) with only 8,000 elsewhere on the Inner Solway. By 9 May all birds remaining on the Solway were on Rockcliffe Marsh (including Redkirk Marsh) and numbers had more than halved to 16,750, the remainder having migrated to Norway. This number had halved again by 16 May and by 23 May only 500 birds were present. Unusually, at least 250 remained on Rockcliffe Marsh until 30 May – finally dropping to 30 by 4 June 2018 – possibly held back by a period of north easterly winds. Due to count variation, with possible inaccuracies and the chance of double-counting, an adopted count total for the population is derived by averaging those counts within 10% of the maximum recorded during the winter. In 2017/18 the counts of 41,496 on 25 October 2017 and 43,545 on 18 April 2018 fulfilled this criterion and were thus averaged to produce an adopted Solway population total of 42,600 Svalbard Barnacle Geese (rounded up to the nearest 100; c.f. 41,700 in 2016/17). The breeding success of Svalbard Barnacle Geese sampled on the Solway Firth from October 2017 to December 2017 ranged from 0.5% to 15.9% (c.f. 0.0% to 42.5% in 2016/17) with a mean of 4.8% young derived from 14 flocks with 13,862 geese sampled (c.f. 16.0%; n = 15 flocks; 7,352 geese sampled in 2016/17). Across the same area, the total number of broods sampled was 151, with a mean family size of 1.8 young, ranging from 1-4 young (c.f. 1.9 young; n = 67 broods; range 1-4 young in 2016/17). Figure 2. 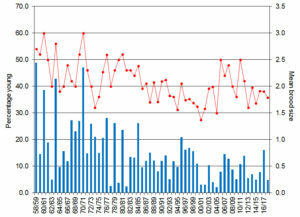 The mean percentage of young (blue columns) and mean brood size (red circles) of Svalbard Barnacle Geese, 1958/59–2017/18. Only two counts of ~41,000 or over were recorded this winter, and coupled with those from last winter, this confirms that the Svalbard Barnacle Goose population has now passed 41,000. The adopted count represents a moderate increase in the population as might be expected given the poor 2017 breeding success. The lower consistency in the counts recorded between late October and mid-April, compared to last winter, was perhaps due to the colder winter conditions possibly causing the geese to spread out more into peripheral areas in search of food. Up until at least 21 February 2018, more than 1,500 geese were still staging/wintering at Budle Bay with 9,000 originally having stopped off there on 13 October 2017. By 14 March 2018, after a further period of snow and cold weather, this number had halved and by 11 April 2018 only 15 were still present, which suggests all of the other birds had finally returned to the Solway. Two closely associating leucistic birds were not seen at the site after the 21 February count, with two new closely associating leucistic bird then being seen on Rockcliffe Marsh by the next census count of 14 March. This observation coupled with the sighting of ringed birds at Budle Bay suggests they are Svalbard in origin and that they moved to the Solway during the colder weather. It will be interesting to see if this east coast site increases in importance as the total population grows; in the previous decade the RSPB Loch of Strathbeg site seemed to be increasing in importance as a staging/wintering site, but this has since largely dropped out of use by Svalbard birds. Many thanks to the Solway census team including Lana Blakely, Mike Carrier, David Charnock, Rowena Flavelle, Jonathan Foot, Bob Jones, Dave Long, Mhairi Maclaughlan, Marian & Dave Rochester and Paul Tarling and to Derek Forshaw for observations from Budle Bay. Previous annual results will be archived here.